After "getting things in order" as described in my last post, the next priority was to redraw my map for St Andrew's Ward. It now looks like the diagram above which, I assure you, in another bit of software, I can blow up to something that can be seen. Yonge Street is at the rightmost edge, Strachan Avenue at the left. Divisions One (pink) and Three (turquoise) stretch from Queen West in the north to Adelaide on the south. The east-west boundary between them was York Street. District Two was the Adelaide-King West corridor from Yonge to Peter Street, beyond the old grounds of Upper Canada College. Divisions Four and Five stretched from Queen to King. Division Four started at Peter and ended at Portland Street, Division Five continued on from there to Strachan. With all that done I could get back to inspecting the households and matching the inhabitants up to the city directories. Division Four started at the southwest corner of Queen and Peter, a tavern named "The Toronto Inn" run by Mrs C McDonagh. From there to Portland Street were two bakers (and another one on the southwest corner of Queen and Portland), a confectioner, one provision dealer, four grocers and a flour dealer handily situated to serve them all. The aroma early in the morning must have been quite something. By Mitchell's Directory of 1864 a lot of the businesses had changed hands. The flour dealer had died and his business had been taken over by someone else. Police Station No 3 had appeared in the middle of the block between Peter and Brock. William Stewart, a painter living at 367 Queen, had become an artist. The family that grabbed my attention was that of William Reeves, the baker on the southwest corner of Queen and Portland. He was 53 and his wife, Mary, was 45. Their household included nine children, two living-in bakers--one of whom was probably a nephew, and William's father, Richard, aged 83. Richard, surprisingly, was not a widower but married. Down the street about half a block was a clerk in his thirties named Henry Floyd with his wife Christina, three children--and his mother-in-law, Christiana Reeves, aged 74. Christiana was married--just like Richard. How interesting. The bakery must have been so bursting at the seams that Mother had had to move in with a married daughter. I wish I could prove the relationship between Richard and Christiana, but the 1851 Toronto census is missing and the couple were probably married in Ireland in the early years of the 19th century. Simply out of curiosity, I would like to know when Richard and Christiana died. But until 1869 and civil registration, the only deaths to be found online are of people buried in the Necropolis. The Reeves family weren't there. Mitchell's Directory does state that William Reeve's bakery had turned into a grocery store run by Mary Reeves, "widow of Wm", by 1864. The Floyds were one of the families to move away from Queen Street--they were found near Hayter on Elizabeth Street by 1864. I wonder if Christiana was still with them? I hope you all had a Merry Christmas. As you can imagine checking the census took second place this past week. However, it was still an excuse for a sedentary break from preparing a slap-up meal with all the trimmings, following the suggestions of a myriad of television chefs for this and that. Two days before Christmas I reached what I thought was the end of Electoral Division Three of St Andrew's Ward. The last five households did not have a folio number and were duplicated--one almost immediately, the other four at the end of the whole ward with a change of address to fit in with their so-called neighbours in Division Five. Today I decided to append special notes to these five houses and their duplicates and to declare once and for all that they all lived on Nelson Street West in Division Three. I noted that the duplicates placed at the end of Division Five were labelled Division Three as were the 30 or so preceding households! What on earth was going on? The Library and Archives film numbers for St Andrew's Ward are C-1101 (part), C-1102 (all), and C-1103 (part). LDS film 0390240 covers the whole of the ward and nothing else. I transcribed from the LDS film so I don't know where the breaks occurred between the LAC films. But I think an accident occurred when the census pages were about to be rubber-stamped with the chronological "folio" numbers. As a result the last 31 houses of Division 3 are hiding at the end of Division Five. Census references in my transcription include the Electoral Division number, the folio number and a line number within each household. These 31 houses with their 213 inhabitants will now be placed in Division Three, but will retain the higher folio numbers which they received before microfilming. The five divisions are now of reasonable sizes: 250 to 260 houses in each of the first three divisions, around 200 in each of Four and Five which are situated further west. When I originally drew up the boundaries between divisions on a map of the ward I thought Division 5 was a peculiar shape. Now I can sort it out. On the map brick buildings are outlined in red, frame buildings in grey. The dotted lines are the fences and walls between properties as illustrated in the Atlas. 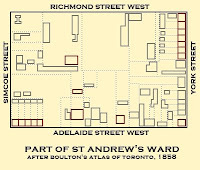 Brown’s Directory indicates that 156 Adelaide was vacant when data was collected later in the year 1861. 150 Adelaide, the eastern-most of the brick houses on the corner of Simcoe, is not mentioned in Brown, but is included in Mitchell. There is also a 148 Adelaide in Mitchell’s Directory (1863-64). This may be a house built after the census. I am assuming that the largest brick house in the block belonged to Joseph Dixon, the land agent. His census form describes his house as 2-1/2 storeys and built of brick and stone. The next brick house belonged to Frederick Upton. A number of families and single inhabitants were found at 116 rear and 118 rear Adelaide West. These would appear to have been separate buildings at the back of the two lots and not flats in the main buildings entered by a back door. James Paterson’s grocery had a York Street address, but it would appear to be equally a property on Adelaide. The enumerator filed the forms in consecutive order west to east. It was great to be able to compare the list below with the map above, and also with the completely different atmosphere of the area today as shown on Google maps! 599. Cornelia Paterson, widow of Archibald, boarding house at 158 Adelaide West. 600. John Ginty, contractor, living with mother & a sister. 154 Adelaide West. 601a. John Bishop, butcher, found in Caverhill and Mitchell at two other addresses in different parts of the city; not found in Brown at all. 601b. Mrs Susan Thomas. Although she follows Bishop and his family on the census form, she appears to be chief tenant or owner. Did not divulge her late husband's name. Found by Brown and Mitchell at 152 Adelaide West. 602. Adam Limberd or Lineberd, labourer. Name misread by both Ancestry and me. Only found in Brown (who can't be depended on to get surnames right either). His lodger Michael Sheils was not to be found anywhere. 142 Adelaide West. 603. Thomas Bryan. Name originally misread. Not found in directories after re-inspection. Had employed children, but they were not in directories either. 604. Chas Cline, tailor, from Witerburg, Germany. Not in directories. 605. Joseph Dixon, house and land agent. 5 children. Found in all directories on first run at 138 Adelaide St West. 606. Mrs Eleanor Hutcheson. Found in all directories, spelling consistent, on first run at 136 Adelaide West. Caverhill had house number as 126—perhaps a typo. 607. Richard Couch. Four different occupations all in the building trade. Found in all directories on first run. 134 Adelaide West. His father, John Couch, part of the household, mentioned in Caverhill & Brown, died in 1863 and was buried in the Necropolis. 608. Fred'k Upton, wharfinger, 6 children, present in Caverhill & Brown--and Necropolis Burials. Brown had his address as 126 Adelaide West. 609. John F Corner, moulder. Found in Brown & Mitchell only. Household includes older lady identified as mother in law. 122 Adelaide West. 610. Samuel Bowman. No occupation in census or in any of the three directories. Always lives at 120 Adelaide West. His lodger, James Loaney was living at 116 Adelaide West in Caverhill. 611. Eli Hussey. tavernkeeper & chairmaker (!). 118 Adelaide West. Moved to Elizabeth Street, St John's, before Mitchell's Directory was published. Family includes married daughter. 612. Henry Johnston. printer at 116 rear Adelaide West. 613. Dan'l Dunning, gardener (surname deciphered after 3 attempts). Makes a long comment on census form (transcribed). Brown finds him at 116 rear Adelaide West. Otherwise, not found. 614. Anne Laid or Lord, fruit dealer, 60, widow living alone. Not found in any directory. 615. James Passmore, porter, with two servants (maybe they just lodged there). Found by Brown & Mitchell at 116 rear Adelaide West. 616. Amy Odell, sewing, widow with grownup daughter. Possible late husband found in Caverhill. Living at 116 rear Adelaide West in Brown, not found in Mitchell. Not in Necropolis burials. 617. Mary McCarty. Very popular name—as a result difficult to match with directories. No one of that name found at 116 rear Adelaide West or anywhere nearby. May have had a daughter working as servant with James Passmore. 618. Robert McCawley, labourer with servant. Not found in any directory. 619. Mary Bauldry, housekeeper. Surname completely misread on first run. Found in Mitchell at 118 rear Adelaide West with a slightly different name to that given here. 620. Ann Morris, widow of George. Caverhill's Directory and Necropolis Burials checked unsuccessfully for an entry for her late husband. Found in Mitchell at 118 rear Adelaide West. 621. David Heslip, labourer. Only sighting in a directory (taking all possible spellings into consideration) was in Mitchell when he lived much further west. 622. James Hart, tailor. Found at 3 different addresses in directories. Brown gave address as 116 Adelaide West. 623. Thomas Hoolahan (sp), porter, wrote his own census form. Why did the three directories given his name as Wholahan, Wholehen, and Wholohan? Address in Brown & Mitchell was 116 Adelaide West (lived elsewhere according to Caverhill's Directory). 624. Uphemia Thompson, boarding house with 3 lodgers and 2 daughters in their twenties. Found only by Brown at 114 Adelaide West. 625. William Hodgins, shoemaker. Found only by Brown at 112 Adelaide West. 627. Fred Milligan, innkeeper, no boarders. 108 Adelaide West. 628. James Paterson, grocer, with address 128-130 York on the corner of Adelaide. With no blogs since May you must have thought I had given up the project altogether. Not so, I have just been so involved with it that I have not wanted to spend any time making a journal in blog-ese. Since the last contribution I have done a re-check of each of the census forms for St George's and St Lawrence's Wards against the three contemporary city directories at one and the same time. Usually I expect to find most heads of households represented in at least Brown's Directory, published in census year, and hopefully in one or both of the other directories (1859 and 1863) as well. When I can't find a directory entry I assume that the family was a wandering one, or that I didn't transcribe it correctly. Many times now I have zoomed in on the suspect census form on Ancestry and discovered that the family surname was quite different from what I thought it was the first time around. These corrections have led to many more matches in the city directories. St George's and St Lawrence's Wards have now been put to bed, and since early October I have been working on St Andrew's which is double the size of St George's. So far I have checked around 650 census forms out of a total of more than 1100. It is a slow process. My yawn factor sets in at about 25 a day. All sorts of supplementary projects have been started--some might amount to something; some have just been time-wasters. Late this past week I found myself working on the north side of Adelaide Street West between Simcoe and York Streets. I came across a variety of situations: revised family surnames, deaths of breadwinners, a wide expanse of means of earning a living. I have decided to share my findings. Watch this space for the next episode. How do you turn a finch into a ferrett? Or, how do you turn a ferrett into a finch? I have been matching people in St John’s Ward with Brown’s Directory, published in 1861-62-—about a year after the census. On the first run for each ward I work street by street in the Directory, finding the same people in the census. That is complete. The second run works from census to Directory, filtering out every one except heads of households who haven’t been found yet. The second run started with about 550 people. Some have been discarded. Perhaps they gave up on Toronto and moved elsewhere. Here, halfway through the F’s, 380 remain to be checked a second time. And here I came across Mrs Charlotte Finch, a widow running a boarding house with four lodgers. She lived in a part of St John’s where the enumerator failed to fill in the name of the street on each census form. I went to Ancestry to re-check her name and found the form had been omitted. This usually means that the writing was more than their transcriber dared attempt. But the next form was there and the surname was clearly Bywater. The Bywaters had been matched to Brown and they lived on Park Lane north of Edward Street. During 1861 Park Lane became the eastern side of University Street which today we know as University Avenue. In Brown’s Directory, on University Street, next door to the Bywaters was a boarding house run by Mrs C Ferrett. I have found many inaccuracies in this Directory over the past few months, but the mind boggles on this one. Just how do you turn a Finch into Ferrett? It was January 11 when I wrote that I was attempting to make a database from an OCR scan of Brown’s Directory of Toronto dated 1861-62. On Friday (11 February), I had a listing of the complete street directory of approximately 8500 entries. OCR is workable on 19th century printing after all, but find-and-replace was far more useful than the automated spell checker that the software makers expect users to employ. I have also experimented with using OCR on the “names directory” in Brown . Having got as far as the D’s, I have decided that it is not worth the effort. In the “street directory” people are arranged by their addresses and the street names only come up as headers; while, in the names directory, there is an address on every line. OCR can find no uniformity in these street names, so there is no time saved over copy-typing. It also appears that entries in the alphabetical list are one per house, no more than in the street directory. Mitchell’s Directory of three years later included most employed people whether they were head of household or not. There is not point on duplicating Brown’s Directory by transcibing a second lot of the same information. The work of matching the census to my new directory database had now begun. 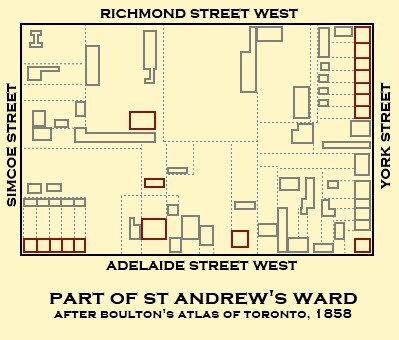 The first ward I attacked was St Andrew’s which included many forms for commercial premises and where street names were omitted for the first division (Yonge Street west to York, Queen West to Adelaide). I had added as many clues from these forms as I could to my transcription including all notes stating “Personal details at place of residence”, signed by the proprietor and, maybe, giving his home address. Two of the first three forms with nameless proprietors have now been matched to actual people. For instance, Mr Leask’s handwriting was very hard to read and I had not been able to recognize the street he lived on, although the house number was 174. A quick inspection of my sorted digitized database found him at 174 Gerrard Street East, as well as the nature of his business downtown. This kind of discovery challenged me to continue the census matching process. I have now finished the letter A for five wards. Two more city wards and the suburbs of Yorkville and East York to go. I hope temptations won’t lead me astray before the end of the alphabet. Certainly, if Brown’s Directory had come into my hands earlier, Caverhill and Mitchell would never have been done. I was trying so hard not to digitize Brown’s Toronto Directory. I thought it would take up too much time and I really was trying to complete the linking of the other two directories to the people who had the fortune or misfortune to be represented amongst the inhabitants of "Institutions" in the 1861 census. About a month ago I succumbed. Since then I have been ensconced in yet another data collection dealing with Toronto in 1861. First, was the compiler, W R Brown, part of the Brown family of The Globe, or was he somebody else? Originally I assumed he was part of the newspaper family, but I am beginning to wonder if my assumption was correct. Living at Idlewold in Rosedale would have meant a long trip to the office everyday. Either his knowledge of downtown Toronto or a great mixup of entries just before typesetting led to a very noticeable error on Front Street West. The south side of the street suddenly jumped from Bay to Simcoe omitting Jacques & Hays’ cabinet works and Union Station. Numbered premises began again after Simcoe with even numbers which should have been on the north side. All the entries actually existed, but the order spoiled the meaning of the word “index”. When I first discussed indexing city directories back in November I said that optical character recoginition (OCR) was not the way to go with 19th century printed pages. A couple of weeks ago I decided to see if another attempt with some software I bought years ago would be more successful. The pages of the directory are filed individually in my computer and each page has two columns of entries. I open each directory page in my photo-finishing/drawing program, Paint.net, where I straighten the page and crop each of the columns to individual images or files. Then I take the separate columns to the OCR program and re-crop to get rid of extraneous lines and blobs of dirt on the image. The image is then “read” by the software. The result is not a pretty sight. To get one line completely correct on a page of 60 entries is unusual. The software is exceedingly poor at distinguishing numbers like “3” and “8” and “6” and “0”. The letters “v” and “y” are almost always misinterpreted. One gets used to these little vagaries. A new discovery for me was that the OCR software permits find-and-replace corrections. I now start off work on each page by getting rid of unwanted double and triple spaces and remove all periods or full stops—things that aren’t wanted in my database style. Other start-up operations include altering the font to a uniform 20-point Times New Roman and typing a title right on the page—usually the book page number and the street it contains. Correcting a column takes about 20 minutes. Each column is saved to an individual spreadsheet file. Once I have a collection of 10 to 20 completed spreadsheets I take a break from OCR work and combine the spreadsheets into one large one where I arrange the data into a series of columns which will ultimately be moved to a database. The whole process probably takes as long as copy-typing the whole book, but because there is such a variety of tasks involved, the boredom factor is reduced. Into the bargain, my aging body is subject to a lot of aches and pains, particularly in the neck and shoulders. Continuous copy-typing would send me into complete lock-down. The other advantage, a personal one, is that, once I have gone through both the OCR and spreadsheet steps, I have a much better knowledge of the street I have been looking at and the people who lived there. Sometime in the autumn, Ancestry put a number of city directories for Canadian towns and cities online. Included amongst these is Brown's Toronto Directory for 1861-2. It proves to be a very worthwhile addition to the collection of listings of people in the Toronto area in the early 1860s period, and the closest one in time to the census. The directories I have seen before were published by men who were not permanent Toronto residents, and they may have employed agents to do the job. (Mitchell's compiler got his own name in the directory.) It was a temptation to cut corners, or perhaps I should say numbers of pages, to reduce the cost of publication for one of a series of books covering different cities across the provinces. But George Brown was producing a directory for the city he lived in--he knew its component parts and they included suburbia. His street directory includes the streets of Yorkville and the area east of the Don River between the Lakefront and Todmorden. We know of George Brown of The Globe, but The Globe was very much a family firm. In 1861, although over 40, George Brown was still living with his parents. His father, Peter, who had started the Toronto newspaper business with his son, was still working in the office. George's brother, Gordon, was actually editor of The Globe. W R Brown was the publisher of the Toronto Directory. Perhaps because he lived at Idlewold, a house on the Yorkville-Rosedale border, he thought it worthwhile to include the areas outside the formal city limits in his publication. Because of its place in the alphabet, Bloor Street was the first of the Yorkville streets I have found. The south side of Bloor Street was in Toronto, the north side between the top of the Don River ravine and what we now call Avenue Road was in Yorkville. Further west, Bloor Street West continued into York Township Electoral District 3. Mitchell omitted the north side of Bloor Street from his street directory of 1864, but Brown includes it in 1862. Many of the people in the Yorkville section are well-known; those further west, lesser so. But, at least, they are there. I am looking forward to discovering more gems from Brown's Toronto Directory. Already it has told me more than I knew before.